SharePoint Designer is in the phaseout stage, what is replacing it?. Three years ago, Microsoft has announced that there will be no new version of SharePoint Designer (SPD) accompanying SharePoint Server 2016, and at least since then the future of the popular accompanying SharePoint product was pretty much clear: there is none. With SharePoint Server 2019 rapidly approaching, we know now for sure: SPD 2013 was the last version published. The SharePoint world is rapidly moving forward, and SPD isn’t. Flow is the new kid on the block for doing BPM. Modern pages look way better than classic SharePoint interface, and they are mobile-device optimized. 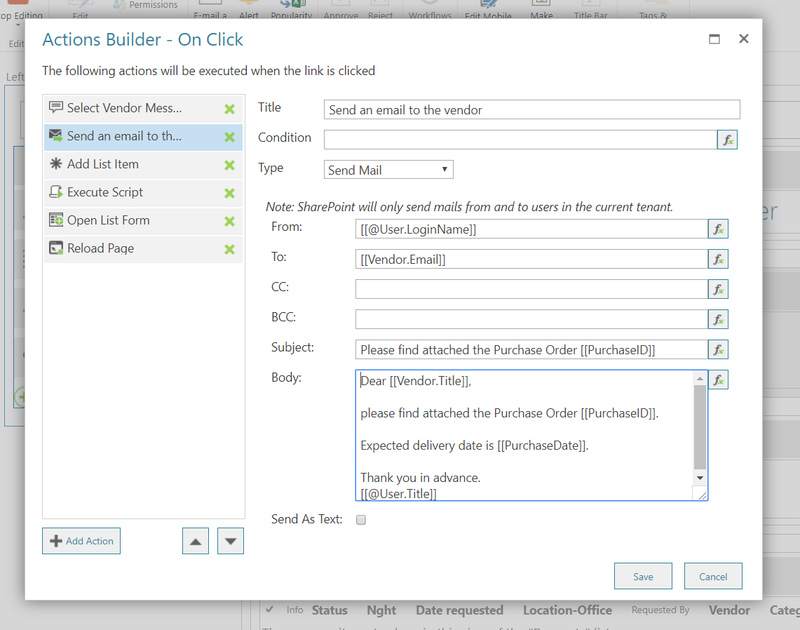 Modern lists have different approach to display, new and edit forms. With all that in mind, one thing is clear: SPD is not only in the phaseout stage, it is rapidly becoming useless. So, what is the power user’s, or even professional developer’s choice, for the brave new world of “new SharePoint”? For the tasks that usually SPD was used for? Short answer: skybow Solution Studio. Let’s now elaborate the long version of the same answer. SharePoint Designer was providing a single environment where you could work on your site, its lists and libraries, pages, data sources, workflows, permissions, and more. While there are different tools out there which can replace SPD functionalities, skybow Solution Studio is the only platform which offers comparable (and widely extended) feature set, but targeted to the “new SharePoint”, as one, integrated environment. Which features are we talking about here? First, creating lists and libraries. It was always much easier to create list and libraries, and their fields and structures in SPD, than in SharePoint web interface. The same is true for skybow Solution Studio: you can create lists and libraries, fields, easy and fast. To even extend the standard SharePoint features, you can make each field (of any field type), being a calculated field using background calculations and aggregations. 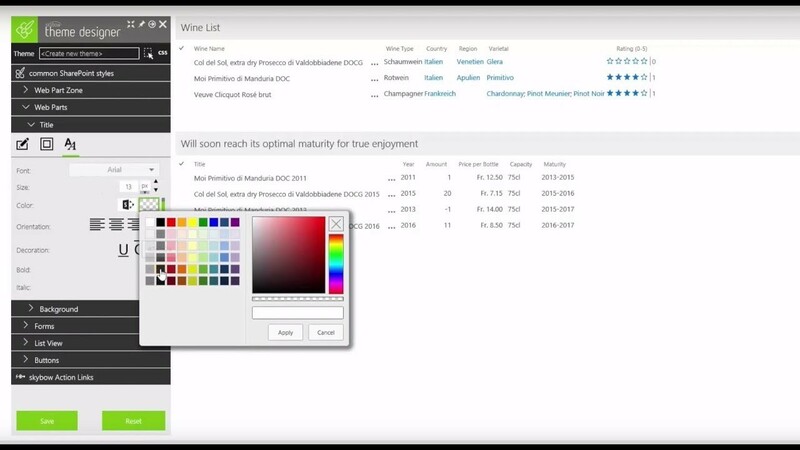 You can also create a cross-site lookups, and many other advanced settings, directly from the skybow Solution Studio interface. Forms, pages and views. 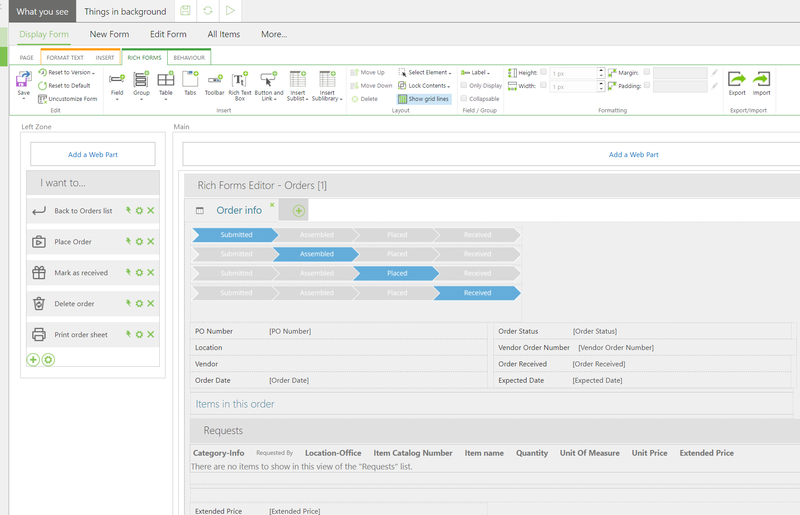 With SPD, you could create new forms and change the design of new and existing SharePoint forms on a very basic level. You had a nice control over SharePoint pages. In SPD 2013 (as opposed to 2007 and 2010 versions), even the design view has been removed, and you were left with editing the code manually. For any advanced operations, you would be going for the external tools, such as InfoPath. You can easily create form groups and multicolumn layouts, tabs and tables, and master-detail forms. 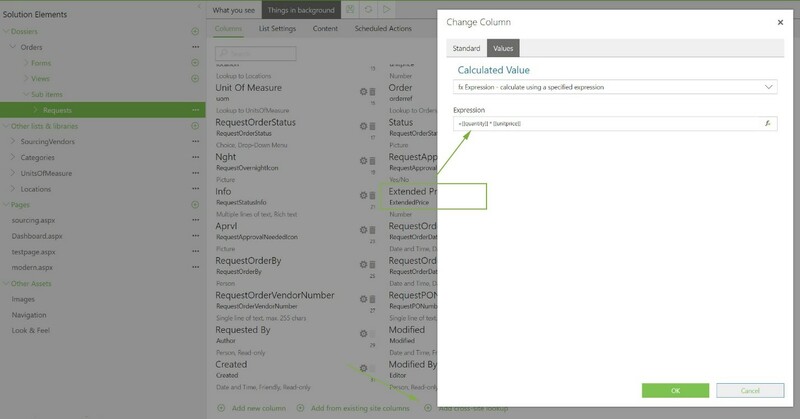 Things like validation, automated calculations and adaptive form layouts are integrated and easily accessible. It is like of you would have a platform that merges functionality of SharePoint Designer and InfoPath, but it is based on modern, current technology stack (client side) and it is much easier to use. 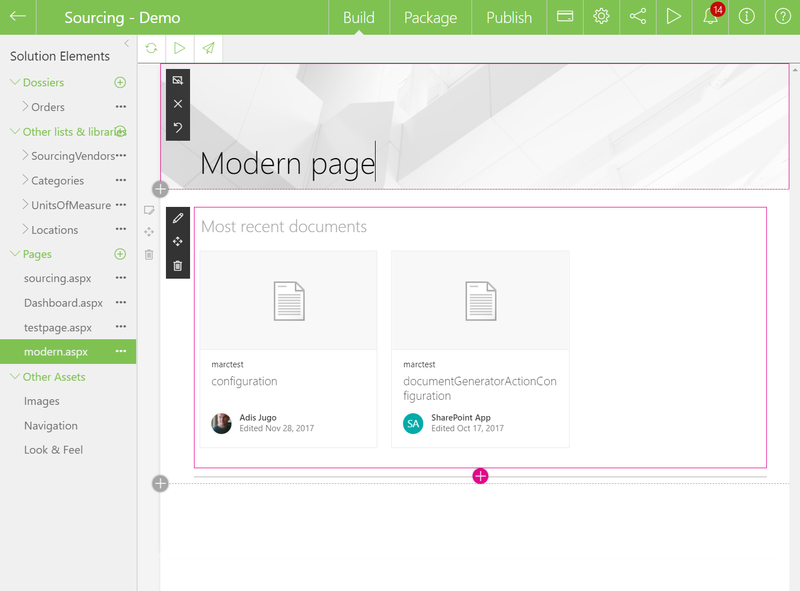 Furthermore, with skybow Solution Studio, you can easily create, design, integrate and deploy classic and modern SharePoint pages. You can create and reuse your content and your data, and design it the way you would like. Picture: example of a purchase process created with skybow Solution Studio actions. The resulting design of the Purchase process built with skybow Solution Studio usually looks something like this. One often neglected, but very important feature of SharePoint Designer was designing and branding – in essence, making SharePoint looks nice. Master pages, Page Layouts and custom CSS were possible to be designed with SharePoint Designer. Most of those techniques are in the meantime outdated, and the usage of some of them – such as editing master pages – is heavily discouraged by Microsoft. We have seen that with skybow Solution Studio, you can create, design and integrate classic and modern pages. But what about design and branding? 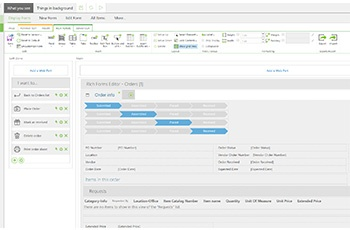 skybow Solution Studio’s accompanying product, the skybow Theme Designer, enables you easy and intuitive design of “new SharePoint” including colors, fonts, themes, and much more. This way, you can make SharePoint looks “yours”, without breaking the rules and the best practices set by Microsoft. With SharePoint Designer, you could save the changes to the site, and that would be it. It was very difficult – sometimes even impossible – to package everything you have created and publish it to a different location. 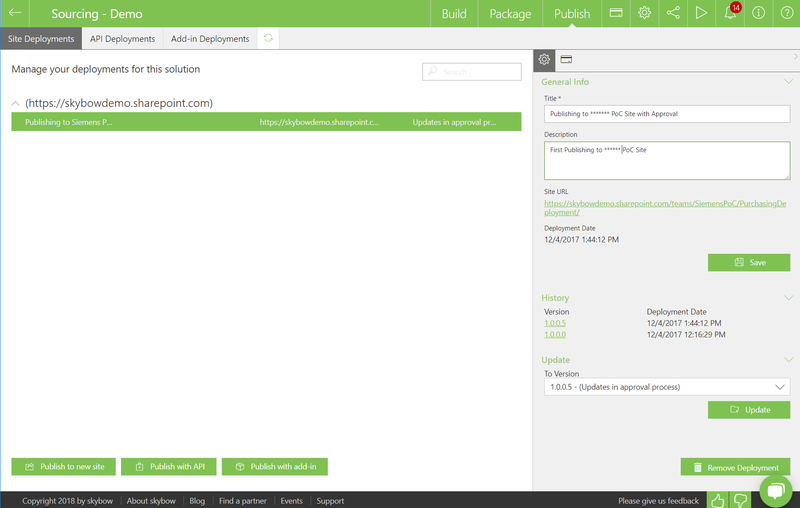 skybow Solution Studio solves this problem through the Package and Publish functionality, which enables packaging SharePoint artifacts (lists, libraries, content types) and all customizations (forms, actions, processes) and design (styles and themes), and to deploy it either directly to another location, or to a store from which it can be further deployed. The full change-update-retract ALM process is also implemented, as well as the deployment cockpit, which always keeps you informed where your solution has been deployed. If you need a decent replacement for SharePoint Designer in the brave new modern SharePoint world, just try skybow Solution Studio. It is free for developers and solution builders. And if you like it, feel free to contact us.